The quality and standards of education systems depends on the quality, character and commitment of lectures to their profession. 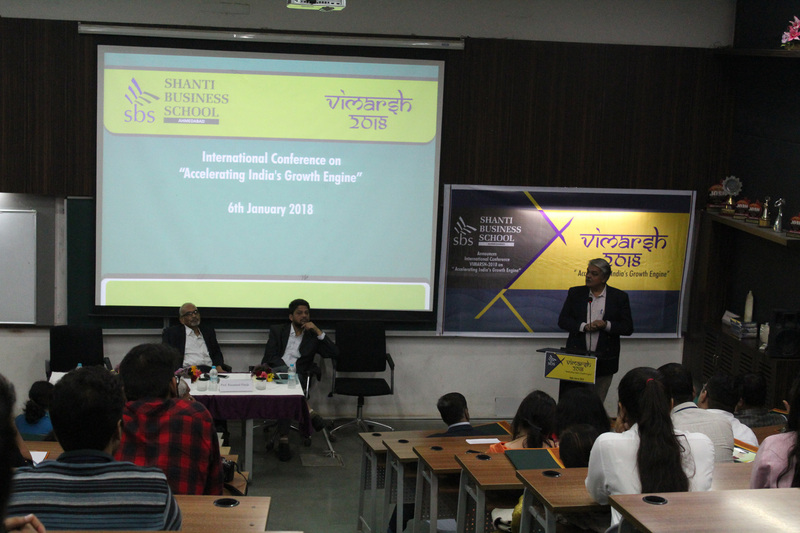 In terms of keeping up with the pace of national and international standards SBS participate and organizes conferences for teaching faculty with a vision to make SBS a more welcoming and diverse institution not for the students but also for the society at large. To name a few VIMARSH is an International Conference series of SBS where practitioners and academicians comes together and exchange views, share and learn from each other regarding the problems, potential and the real life uses of the system. We aim to attract the most able and creative community. Faculty Development programs strengthen the professional development of the faculty members and administrators who deal directly with students. Our goal is to help these educators increase the effectiveness of their teaching, especially in professional programs, so that they are better able to guide students on journeys of inquiry and discovery. Faculty of SBS has participated in FDPs of some the top institutions. SBS offers programs for working professionals that are designed to provide timely learning interventions that helps them upskill and progress their careers. It assists them to harness their untapped potential. We design dynamic programmes based on current business scenario. Our team identifies current challenges through extensive research on business environment with discussions with industry experts, management thinkers, and corporate leaders and offers varied range of programs for working professionals. Industry visit has its own importance in a career of a student who is pursuing a professional degree. It is considered as a part of college curriculum and objectives of industry visit is to provide students an insight regarding internal working of companies. SBS has organizes numerous sectorial specific industry visits for its students and faculty. Some of the top companies are Texspin Bearing Ltd., One Advertising, GIFT City, Red FM, SKF Technologies, Coco Cola, Ramdev Masala, National Dairy Development Board, Amazon Facility, Moving Pixels Pvt. Ltd., Times of India, McDonalds, etc. Bridging the gap between the industry and the students is the main objective of SBS. By keeping that in mind, SBS has created a property named HIRE, where we invite industries to come on campus to full fill their recruitment needs. Graduates from all across different colleges participates and at the same time recruiters are exposed to larger talent pool. Last year 1800 students and more than 30 companies visited SBS and 100+ offers were released. Seminars are conducted on a regular basis on various topics. A domain expert either from an industry or a faculty with vast teaching experience in that particular subject delivers lectures and presentations. Experts from industry and academics, both shares their insights and experiences. Industry experts from companies like S&P Global, Muthoot Finance Group, SNL Financial, Reliance BIG TV, Infosys Ltd., Tata Nano, TCS, Johnsons & Johnsons, Corpret Fox, Dentsu Inc., Elitecore Technology, Tata Docomo etc. have conducted multiple seminars on varied topics. Different training tools, role plays and case studies are shared which focuses on practical implications. Such workshops are conducted on time to time basis. Workshops are innovative and creative way of sharing practical and logical insights. Workshops from IIMK, IIMs, etc. has been conducted for our students. AMA is an approved institution for management training by Govt. of Gujarat. It is the promoter and founder member for All Indian Management Association. All Indian Management Association is a premier body for imparting professional management courses in India. SBS is a registered member of AMA. The institution specializes in offering summer and short term courses. Wadhwani Foundation facilitate high-quality job creation through entrepreneurship, skills development and innovation solutions. It facilitates entrepreneurial programs and start-up immersions. The foundation is known for creating large scale job creation with presence in ASIA, Africa and Latin America. Yi is an integral part of CII which is a platform for youth. Yi holds more than 2500 activities each year under the pillars of Youth Leadership, Nation Building and Thought Leadership, and connects with 14000+ students through its institutional network, ‘Yuva’.